Some things get better with age. We believe your life should be one of them. With our Live Simply timber frame floor plans, it’s easy to create the timber frame home and life you’re ready to enjoy … today and for all of your tomorrows. From a cozy and quiet retreat to a hustle and bustle family gathering place, Live Simply models offer adaptable timber frame floor plans starting at 2,500 sq. ft., designed with an open-flow floor plan, an inviting kitchen and a first floor master. 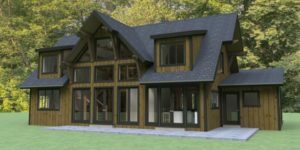 Live Simply ready-to-purchase timber frame home plans are designed with Mid-Atlantic Timberframes quality, using pre-fab timbers and structural insulated panels (SIPs) to ensure a structurally sound and energy-efficient home.